Home > Products > Special Offers > HONDA'S 2017 LAWN & GARDEN PROMOTION HAS BEEN EXTENDED ! 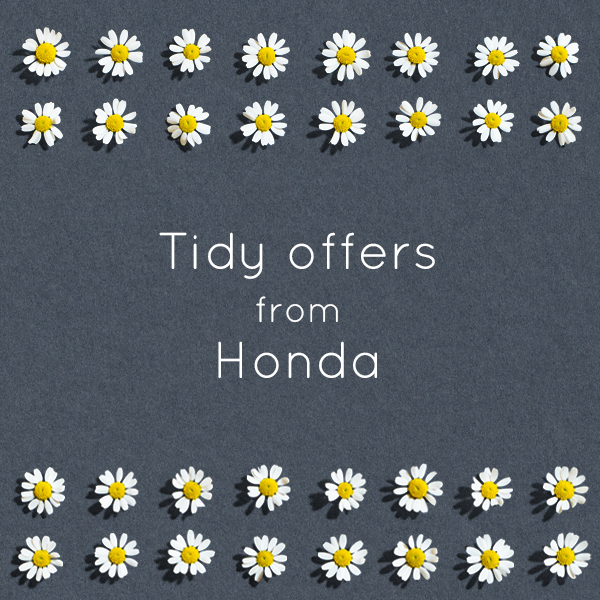 We have received notification that the 2017 lawn & garden "Tidy Offers From Honda" has been extended. So why not take advantage of this superb in season offer. With lawnmowers & ride-ons extended to the 30th Septmeber 2017 it really is time to treat yourself to that new machine. Below are the savings to be had on some of our most popular models. Honda IZY, 16", push - £364.00 - £65.00 = £299.00. Honda IZY, 18", self propelled - £539.00 - £60 = £479.00. Honda HRX426SX, 17", self propelled with roto-stop - £799.00 - £100.00 = £699.00. Honda HRX476QXE, 19", rear roller, roto-stop - £1,039.00 - £90.00 = £949.00. Honda HRX537HYE, 21", hydrostatic drive, versa-mow mulch function, roto-stop - £1,289.00 - £90.00 = £1,199.00. Honda HF2417HME - 40", hydrostatic drive, versa-mow mulch function, superd ride-on tractor - £3,999.00 - £400.00 = £3,599.00. With over 40 Honda machines on display why not call in and see for yourself why the Honda range of equipment continues to be the leader in its sector.